Holiday Home in Portree, Isle of Skye, Scotland - Peaceful Location 20 Minutes Walk from Portree Centre, Ideal Touring Base or Retreat. Welcome to our holiday home on the beautiful and historic Isle of Skye. This 2 storey house has electric central heating and is doubled glazed throughout. It provides the ideal base for touring or just cozying up and watching the ever changing vistas. The house has an open south facing aspect with views from all the windows. There is an open plan living area downstairs and the upper hall sitting area has a large picture window. There are 2 en-suite double bedrooms and the 3rd double bedroom is adjacent to bathroom with over bath shower. The garage has washing and drying facilities. A patio door leads out from the dining area to a decked area. The garden faces south, adjacent to natural croft land and off-road parking. Portree and its natural harbour is within walking distance and has an excellent range of facilities. Cultural attractions are plentiful and sports enthusiasts are well catered for with walking, climbing, cycling, boat trips. We also have Fibre Broadband with up to 52Mb download speed. I was born and brought up on the Isle of Skye. Our family have spent many holidays on Skye and now as adults still love to visit. Achachork has always been a favourite part of Skye for us with its panoramic views and being within walking distance of Portree, the main village on Skye. When this site came up we decided to go ahead and build a house taking into account the wonderful views across Portree to the Cuillin Hills beyond. We are very lucky to have a lovely house built to our own specification with everything we need in a holiday home and wonderful views to enjoy from every window. The views from the house towards the Cuillin Hills are spectacular and the house is warm, comfortable and has all the mod cons required for a relaxing stay. As a base the location is perfect for day trips throughout the island being so near Portree. There is nothing better than to sit on an evening with 'refreshments' and watch the setting sun turn it's magic on the landscape, no matter which season there is always something different to view. Bedrooms 1 and 2 en-suites have walk-in shower, basin and wc. Bathroom adjacent to bedroom 3 has feature bath and basin with over bath electric shower. Electric Neff hob, fan assisted oven, dishwasher and fridge. Microwave, toaster, kettle. Walnut kitchen units with black worktops and breakfast bar. Table and seating for 6 in open plan dining area with patio doors leading to outside decked area. 9 hole golf course at Sconser which is approximately 30 mins by car (13 miles) south of Portree. Notes on accommodation: Full electric total control central heating and double glazed throughout. We are sorry but the house at present is not fitted out for toddlers/young children. The garden is fenced. We are sorry to stipulate no pets. Changeover day is Friday to Friday for 7 nights. Outside: Large open south facing garden area adjacent to natural croft land. Outside decked area and garden chairs and BBQ in garage. There is also an outside rotary clothes line. Utility Room: Leading from the kitchen the garage has a washing machine, freezer and ample drying facilities and shelving. Walking boots and outdoor gear can be stored here. Cleaning / Towels / Linen / Rates include wifi access, towels, linen, electricity and central heating. The property is cleaned and checked weekly on a Friday. Other: Entrance vestibule with large built-in cupboard with coat hooks, radiator and shoe rack. Full length mirror on opposite wall. Totally relaxing with all amenities! Being just out of town is a perfect setting for a group stay. Spacious and clean, this house easily accommodates 6 adults, with ample seating and a fully stocked kitchen. Beautiful sunsets from both sitting areas! Good beds, linens and towels. Great place to relax after a busy day sightseeing on the Isle of Skye. Highly recommend. The only word I have to describe this property is TERRIFIC!! For hikers and sight seers this is the perfect haven for a wonderful experience on Skye! First, it is ideally located just slightly north and west of Portree on the A87 which provides easy access to the west and back through Portree to the A863 which covers the south part of the island. We hiked every day of our week on Skye and found that the hikes were always a short distance from our VRBO. Secondly and equally important was this beautiful accommodation. This is a modern, nicely appointed home with all of the amenities that make it a very comfortable stay. With the exception of a few evening meals in Portree, we ate in most every meal. The kitchen was nicely laid out for meal preparation and we had all of the kitchen utensils, plates, bowls, and silverware, that one would want. There was even a knife sharpener for those chefs that know their way around good cutlery. The bed rooms were nicely furnished with very comfortable soft sheets and very nice comforter. After a hard day of hiking we loved the great showers and the very comfortable bathroom with an outstanding heated towel rack. There were even laundry facilities on the property which allowed us to wash our clothes after a day hiking in the bogs. The mud room in the entry was terrific and was a great place to dry boots and rain gear after a day on Skye. There were four of us and the living and dining rooms were a wonderful place to eat and gather to compare adventures and hiking stories. To summarize, this is a wonderful VRBO that offered all that we needed and more during our stay in Skye and we would come back in a heartbeat. Thank so much for taking the time to write such a wonderful and detailed review. I am so delighted that your party enjoyed your stay in Skye and especially Arus. Our house was built and furnished as a family holiday home and for the comfort of our guests taking into account the beautiful views. This is us second time we have been to Arus , (the first time we have returned to a holiday home ) Skye is such a magical place . The house is fabulous, comfortable and wonderfully laid out . Everything was spotless . It is about 2.5 miles away from Portree , with an array of shops , so everything was really handy ! I would recommend the north of the island , the quarang - the columbo 1400 cafe in Staffin - the faerie pools - glen brittle beach , Talisker beach for the most amazing sunsets - loch courisk bear Elgol - everywhere really ! The first holiday we had , the weather was amazing , which obviously helps - the second time , we had a very mixed bag ! Together with the fact that I was incapacitated with an ankle injury , I wondered whether the house would feel the same - Arus is so well laid out , and spacious , that being indoors wasn’t a chore , and watching the weather change the views , was just as wonderful - as watching the sun in the mountains - a beautiful place , a lovely house , and surrounded by your family - what else do you need ! I would return to the house time and time again , and can’t recommend this house highly enough . Thank you for letting us share your little piece of heaven ! Thank you for taking the time to post a great review of Skye and our house. Delighted you enjoyed your holiday despite the ankle injury. Arus is the best place to spend time in with the lovely views and open light space. Comfortable, clean well equipped home with lovely views. Great location and yard. Easy correspondence and prompt replies from owner. Highly recommend if you are looking to spend time on Skye. 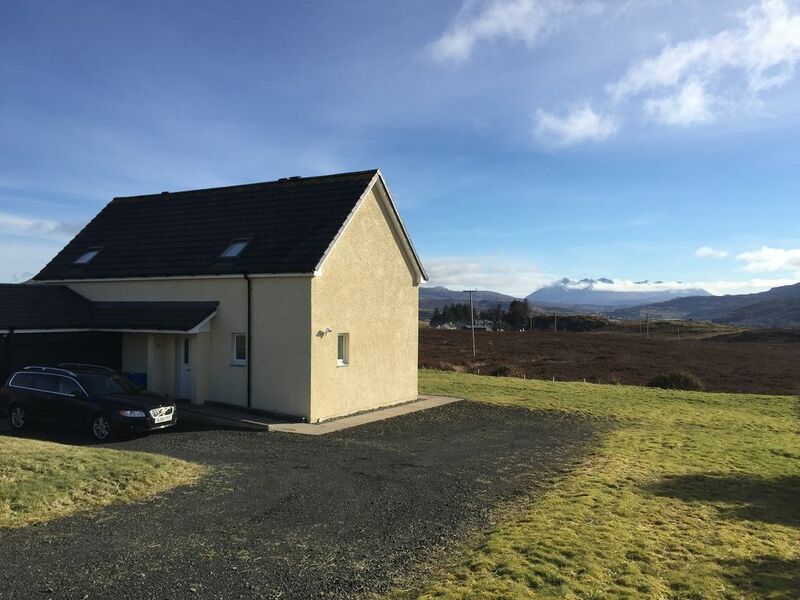 Lovely house, extremely well appointed and with the desired views of the Cuillins. The weather was very kind to us during our week and therefore we were mostly out walking. The house is only a short distance (1.25m) from Portree and therefore ideally placed to allow us to dine out and walk back in the warm summer evenings. The house itself was very comfortable with everyhting that we could need or want on holiday, even if the weather had been more inclement. Would thoroughly recommend the house which was considered by us to be very good value. The house is approximately one mile (20 minutes walk) from Portree harbour and bay. Further afield there are plenty of small beaches (both sandy and shingle) to be found on the Island. Use of car recommended and essential for touring the island. Nearest airport is Inverness (2-2½ hours by car). Regular flights south and car hire available. Also Glasgow Airport is an alternative. Nearest train station is Kyle of Lochalsh which is approximately 45 minutes by car. Nearest town is Portree, the main town on Skye which is 20 minutes walking distance from house, or approx 3-4 minutes by car to centre. Nearest facilities, shops, supermarkets, restaurants, cash point and nightlife in Portree. Kyleakin and the Skye Bridge are approx 45 mins by car. Uig ferry to the Outer Isles approx 30 mins by car. Sligachan and access to the Cuillin Hills approx 20 mins by car. Dunvegan Castle is approx 30 mins by car. Armadale ferry is approx 1 hr 15 mins. Notes on RATES: Rates are in UK Pounds. Rates includes linen, towels, wifi access, central heating and electricity. Booking Notes: A separate £100 security deposit is payable when payment is paid and is returnable once the house has been checked after departure. Changeover Day: Friday to Friday or Saturday to Friday. Please depart by 10:15am on day of departure. Arrival anytime after 3.30pm. House cleaned between lets.